How do you make your front and back door locks as secure as possible? You need high security cylinders, you can buy the best from me, for all your external doors and if you wish, have the same key open all for your convenience. I can have them send securely to you by courier and nobody will know you changed your locks. It's simple, as most things in life are, when you know what type of product to use. Anti-snap cylinders prevent a common method used in burglary which is cylinder snapping. Snapping the cylinder is made much easier for the burglar if the cylinder is not flush fitting on the outside (that is smooth with the surface of the door handle), thus allowing for an easy hammer strike. So at a very minimum your euro-profile (barrel) cylinder locks (see the type in the picture) should be flush fitting when viewed from the outside. This is more critical for cylinders at the back or the side of the house because very often entry by snapping the front door cylinder is avoided as the burglar may be easily seen. Still it is so fast to gain entry in this way that most often nothing is noticed. You need to measure the cylinder to order the correct size, we can advise you on that as well. 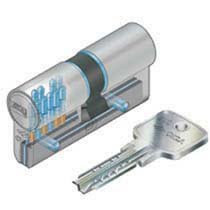 Anti-drill cylinder locks speak for themselves, locks are commonly drilled out, so an anti-drill cylinder lock will protect you against this method of entry. In the case of anti-bump locks we are getting a little more technical, for this method of entry a burglar needs to be better equipped. A certain type of key is used combined with a few steps we do not need to go into here. Suffice it to say that if you feel the need to upgrade your locks it is well to install anti bump locks. How to make your front door lock on closing and so require a key to re-enter your house, even when your present front door lock does not allow for this? Many people call and ask me to adjust their present front door multi-point (or lift and lock type) lock. They need their front door lock upgraded; or an additional lock installed on the wooden, aluminium or PVC front door which will ensure that the door will lock on closing. Then the door will never remain on the latch when they are inside or outside the house, unless they choose this option by setting a button on the lock from the inside. Otherwise they have to key lock the door from the outside every time they leave the house, this is likely not to happen with teenage children and other scenarios. To eliminate this issue and increase security I have a simple solution. My solution has come about after a study of all the multi-point locks and handles which I sell. I have looked at all the methods of adjusting these, which involve clutches and over-rides and split handles sets and thumb-turns which change the status of the multi-point lock when the house is occupied to when it is not. There is complicated ways to do it as well. The best solution is almost always the simplest, so I fit a night latch and rim lock to these doors. The existing multi-point lock is unaffected the rim lock night latch solution is in addition. Now when the door is closed the night latch locks it and a key to the rim cylinder is needed to open the door. The back set measurement (40 mm, 50 mm or 60 mm) of the night latch back-box has to be chosen to position the rim cylinder in the best fitting position on the door style. The door boring has to be done with care to get the 32 mm hole in the correct position. The button can be engaged on the back box to hold this lock open and so return the door to previous status for free entry during social gatherings etc.Give me a call on 021 4883131 or email me john@emhardware.ie and I will provide the correct lock for you.